"Basketball hoops are as much a part of the tableau of San Pedro La Laguna, Guatemala, as the pat-pat-pat sound of women slapping tortillas into shape in storefronts. In recent years, Guatemala has been re-embraced Mayan culture. For many of the Tz'utujils, who live on the south shore of Lake Atitlán, basketball offered a connection to a traditional Mayan sport, in which players use their shoulders and thighs to put a ball through a vertical hoop. At the same time, globalization has brought outside influences to the country. Basketball, then, is a both link to the present and the past. 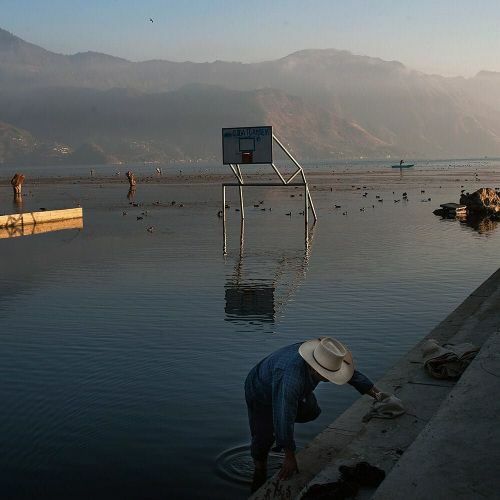 @daniele_volpe photographed a court in San Pedro, where the water level of Lake Atitlán had submerged everything but its backboard and rims. #🏀" By nytimes on Instagram.